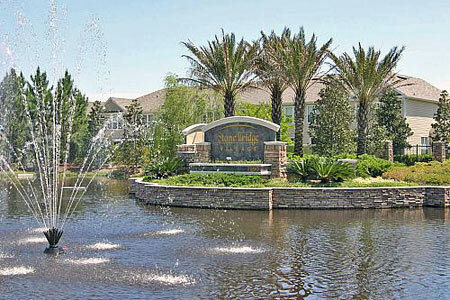 Stonebridge Condominiums and Townhomes in Jacksonville, Florida. Located on East Baymeadows Road, Stonebridge is one of Jacksonville's most desirable gated condominium and townhome communities. Residents enjoy a private, electronic gate community in a pristine setting with close proximity to entertainment, dining, shopping, schools, libraries, hospitals, and the beaches. Stonebridge offers three condominium floor plans available from 1,050 to 1,408 square feet. The condominiums are built with concrete block with steel construction (CBS.) Townhomes with attached one-car garages are built with wood frames and maintenance-free vinyl siding. The amenities include clubhouse with big screen TV, swimming pool, fitness center, nature trails for walking, jogging, and assigned covered parking. Monthly association fee includes water, sewer, exterior pest control, access to the clubhouse, pool, fitness room and car wash area.